Worcester - Following the launch of its new Hilux bakkie in February, Toyota has unveiled yet another major model in South Africa, this time setting its sights on the medium-sized SUV market - the new Fortuner. The first-generation Fortuner was launched in South Africa in 2006 and soon became a market-dominating model for 4x4 and urban lifestyle enthusiasts alike. The second-generation Fortuner has the same underpinnings and body-on-frame chassis as the new Hilux. The new SUV measures 4.7m long, 1.8m wide, and 1.8m tall with a wheelbase of 2.7m. Capable, competitively-priced, spacious and decent interior quality... the Fortuner has the makings of yet another best-seller. The Fortuner wants to be all things to all people; an urban transporter and outdoor explorer, with comfort and ability in equal measure. No vehicle can do it all - at least not perfectly - though the new Fortuner ticks the right boxes. It would be a travesty to drive a Fortuner and not go seeking adventure, fortunately for local motoring journos, the excellent 4x4 facilities of Klipbokkop mountain reserve, near Worcester, proved the perfect proving ground for the new SUV. The Toyota Fortuner is available with a choice of new petrol- and turbodiesel engines. In terms of diesel units, as per the new Hilux, you have a choice between the new 2.4-litre (110kW/400Nm) and 2.8-litre (130kW/420-450Nm) units. A normally aspirated 2.7-litre (122kW/245Nm) four-cylinder petrol engine, as well as a 4-litre V6 capable of 175kW/376Nm, are available. The new Fortuner uses a new six-speed manual and automatic transmission. Available on all grades in both configurations, the 'boxes have a wide spread of ratios to, Toyota says, "optimise both take-off performance and fuel economy at highway speeds". Manual versions receive Toyota's newly-developed intelligent manual transmission (iMT). Fuel consumption for the 2.4 litre GD engine is 7 litres/100km in the manual and 7.9L/100km for the auto. The 2.8 litre GD is rated at 7.5 to 8.5 litres/100km in manual and auto guise, respectively. Toyota's engineers have done a superb job developing the new SUV's chassis and suspension. The ride is smooth, comfortable and overall a great improvement compared to the harsh on-road manners of its predecessor. The new 2.8-litre turbodiesel is noticeably smoother and more refined than the 3.0-litre unit it replaces. Coupled with the equally new six-speed auto and you're presented with a comfortable, powerful SUV. There's a hint of turbo-lag, but once it gets going there's plenty of mid-range grunt. Despite its size, it's surprisingly composed through corners with minimal body roll. Steering is adequate, if somewhat disconnected and its suspension is supple, capable of absorbing bumps and undulations with aplomb. 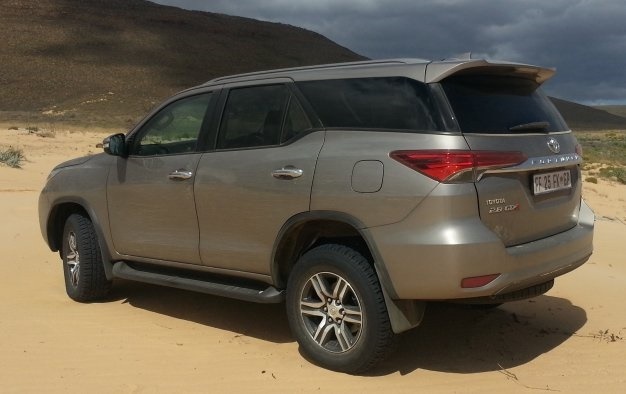 The huge investment in chassis and suspension pays off as Toyota's new medium-sized SUV handles particularly well, though if you're travelling at moderate to high speeds you need to be mindfull of its bulk through twists and bends. The new iMT six-speed manual is great, offering smooth shifts and the additional gear, compared to the outgoing five-speed, is great for fuel economy with an overall wide spread of ratios. The auto version has a split personality - superb if you leave it in default mode, moody if you decide to take control manual during a spirited drive. Shift it in drive, activate the power mode and you're treated to a great ride with ample power for tackling hills or overtaking. However, when selecting manual mode or using the paddle shifts, the gearbox becomes temperamental, delaying shifts at moderate speeds despite commands from the driver to do so. It's bizarre, as it makes the steering-wheel paddles a tad irrelevant. Watch: The Fortuner drifts too!? Toyota designed its latest model to be an all-terrain conquering SUV and it's driving in the great South African outdoors where the Fortuner truly shines. Simply put, its off-road prowess is astounding. The new SUV is in its element tackling medium to severe 4x4 trails. Traction is ever-present, especially with low-range and its rear-differential engaged. Its new hill descent control makes low-range crawling a breeze. You can leave it in high range (H4) when taking on general low-grip, rough terrain. It boasts with 279mm of ground clearance, making it one of the highest-riding mainstream SUVs in its segment. Overall, while not exactly on par with Toyota's flagship 4x4, the Landcruiser, the Fortuner excels in the rough stuff. Since it's based on the utilitarian Hilux, you might not expect the interior to be premium, yet step inside its spacious cabin and you'll find it to be rather upmarket compared to its predecessor. It has durable plastics throughout to give it a rugged feel, with some modern design cues such as a touchscreen and chrome-esque highlights. 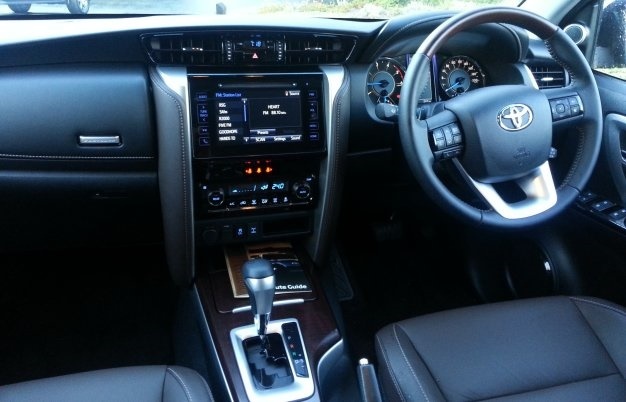 It sports a minimalist design typical of current Toyotas in SA and overall it's a pleasing interior with ergonomic controls and great functionality. Luggage space is rated at 200 litres with all rows up, 716 litres with the third row down, and 1080 litres with all rear seats stowed. Overall, the Toyota Fortuner is primarily a rough-and-ready, feature-packed SUV with great off-road capability and seating for seven. If you’re a serious outdoor enthusiast but in need of a more family-orientated vehicle than a Hilux, the Fortuner could be the SUV for you. The new Fortuner takes its place as a genuine four-wheel-drive performer capable of delivering the quintessential 4x4 driving experience combined with practicality of a family SUV. Another benefit is resale value. 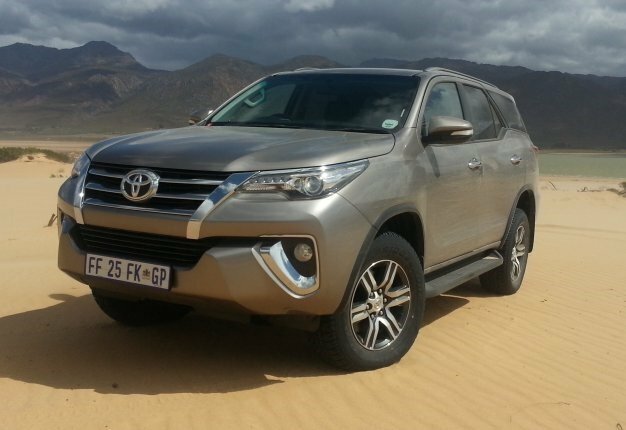 Given its history in SA, the new Toyota Fortuner should retain its value. In fact, it's a testament to the popularity of the product that Toyota claims the outgoing model is its "smoothest run out" yet. Toyota aims to sell 1000 units a month (the automaker says average monthly sales of the previous Fortuner were 700 - 900 units). Features: aircon, four-speaker audio system, cruise control, keyless start button, chilled glove box, 17" alloys, front and knee airbags. Builds on Entry grade and adds: auto climate control, leather upholstery, six-speaker audio system with 18cm touch-screen, curtain and side airbags. Standard grade features as well as satnav and a powered tailgate. 'My dad's Hilux is so tough it can pull a bus'... Toyota has launched its best Hilux bakkie yet in South Africa. Watch this cute ad.